Welcome to the Facebook Marketing Strategy series in which we share the best practices for how to use Facebook for business! This is part 12 of the series. Facebook users have a lot of clouts — that’s why you need to encourage them to share on behalf of your brand and empower them to be your amplification system on Facebook. Remember the Facebook share button? By planting it on your blog posts and articles, you can make it as easy as possible for readers to share right from your page. Take this post from Outside Magazine. Visitors can read it, enjoy it, and share it — all from the same place. Share buttons are a necessity. But users won’t share unless they deem your content share-worthy. That means publishers should stick to posting high-quality, original storytelling, and cutting the clickbait and “fake” news. This shouldn’t be too surprising. Facebook has been discouraging clickbait since 2014, and Mark Zuckerberg has been on a mission to battle fake news since the 2016 Presidential Election. He also just announced that users will be asked to rank publishers by how much they trust them. And publishers with low scores may see a decline in their Facebook reach. Winning publishers won’t phone this one in. Many might be used to posting on Facebook, walking away, and hoping that they receive some engagement in a few hours. But this strategy won’t cut it anymore. To succeed after the Facebook algorithm update, publishers will have to work hard to cultivate their audiences on Facebook. Facebook Ads Coach Monica Louie recommended publishers to focus on quality over quantity by tweaking the types of content they share on their pages. She emphasized sharing fewer articles and images while focusing more on timely content and posts that encourage thoughtful answers in the comments. For example, you can ask thought-provoking questions and do Facebook Lives that focus on newsworthy information or updates that your audience cares about. If publishers have any chance of generating engagement and traffic directly from their Pages, it’s going to come from shares and interactions — not just scheduling some posts and calling it a day. Influencers are the real winners here. They’re now more valuable to publishers than ever because they’re the perfect middleman between media outlets and users — in fact, they’re a little bit of both. By partnering with influencers, publishers can get their content shared on Facebook by “real” users who are more trusted by the algorithm — and by audiences. Publishers interested in exploring this strategy can take notes of a recent webinar co-hosted by Mention and GoToWebinar. In the webinar, Joei Chan, Content Marketing Manager at Mention and Daniel Waas, Director of Marketing for GoToWebinar, shared several strategies on how to work with influencers to boost credibility, expand reach, and engage a wider audience. Facebook ads have been a saving grace for publishers since the algorithm started to hurt their organic reach. Netta Kivilis, VP of Marketing at Keywee, pointed to some interesting trends. As a platform that helps publishers and brands to distribute and optimize their content, Keywee found that more publishers are paying to promote their content on Facebook and the average ad spend on Facebook continues to increase since 2016. Despite the fact that sponsored posts are still an important tactic for targeting specific audiences and promoting products, it can’t be the end-all-be-all tactic that drives your Facebook strategy. Netta recommended that publishers should not simply spend more on Facebook — instead, they should invest in Facebook for strategic initiatives such as audience development, digital subscriber acquisition, and affiliate marketing to boost ROI. Meanwhile, publishers should continue to leverage insights to keep Facebook campaigns efficient and effective. Allen Finn, Senior Content Marketing Specialist at WordStream, also emphasized the importance of closely monitoring Facebook ad spend to avoid wasting any ad spend. He recommended using a tool such as Facebook Ads Grader to assess the activity and optimize the performance of your Facebook campaign. To make up for the referrals they lose from Facebook, publishers might end up buying traffic, as ad fraud consultant Augustine Fou told Digiday. But a lot of those resellers will only provide low-quality traffic. As a result, publishers will lose money and credibility with advertisers. Yes, Facebook is important. But it is not the end-all-be-all of social traffic. 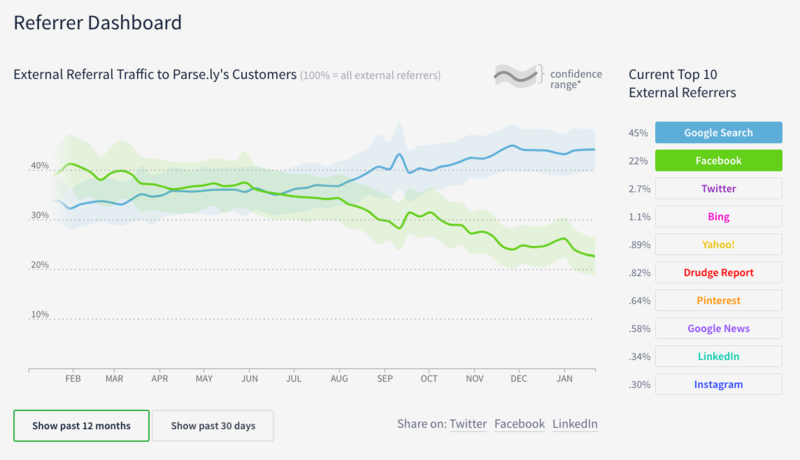 Just consider this data from content optimization and analytics platform Parse.ly. It clearly shows that referral traffic from Facebook is declining while traffic from Google is rising for its customers. 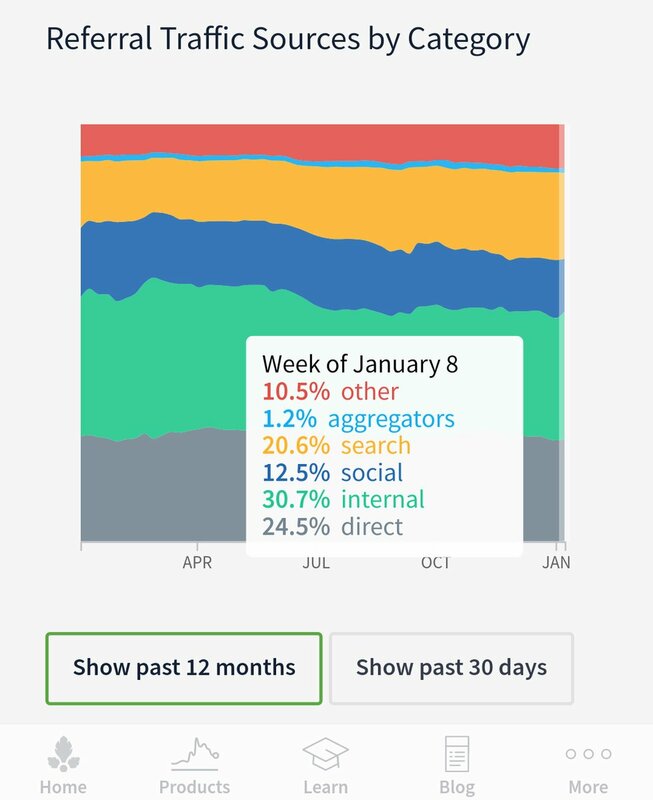 Even then, as Parse.ly CTO Andrew Montalenti reported, the overall decline of Facebook is just a few percentage points when you consider all traffic categories, as most publications rely on other sources like search and content aggregators. That’s why — in the wake of the Facebook algorithm update — you must continue to build out strategies for other referral channels like Google, Flipboard, and dark social. Dark social, for instance, is a term for when readers copy and paste content links onto their social platforms instead of using share buttons. It’s often a private form of sharing, as it usually happens on the one-to-one or one-to-few channels like email, instant message, or text message. And it can’t easily be tracked since it’s done manually. At ShareThis, however, we recently analyzed 113 million shares across open and dark social channels to better understand how users share in private. Most notably, we saw a +6% monthly increase in dark social share volume in our publisher network from July 2017 to January 2018. This indicates that a growing number of readers are sharing under the radar. To stay on top of these shares, publishers need to start offering social media buttons for private channels like text, email, and WhatsApp. This way they can track these dark shares, better understand audience behaviors, and optimize their strategies accordingly. A year from now, when people are selling “I survived the Facebook News Feed Changes of 2018″ T-shirts, you want to be there to collect yours. And you can be. You just have to be smart about how you approach your Facebook strategy in 2018. Think about it: Facebook probably wants to keep its seat as the biggest social news source. But Zuckerberg wants to make sure people are seeing real, high-quality news stories that are worthy of being shared. Prove that you can provide those stories, and you may make it through just fine. Make it easy for readers to share your content with the Facebook share button! 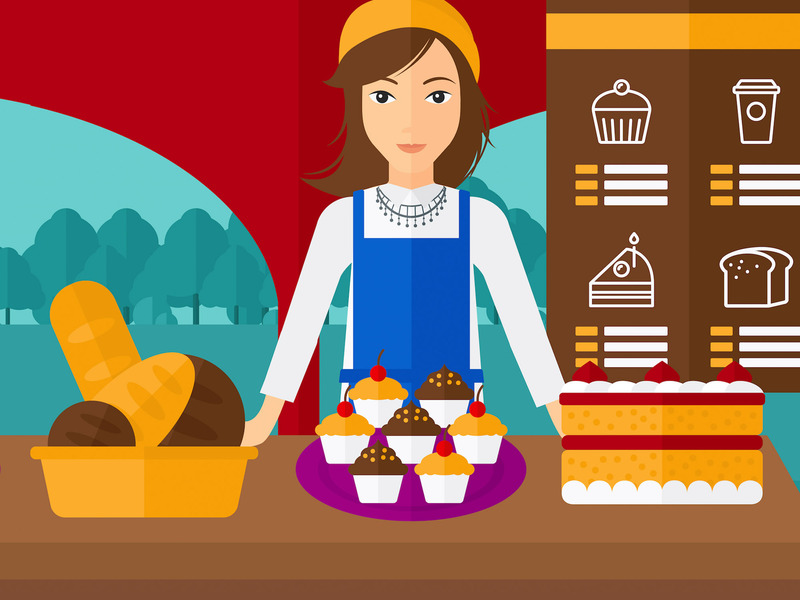 Want to build your audience on other popular channels besides Facebook? Check out these posts.